My day's errands took me in the vicinity of the Studio, and decided that I could spare about 30 minutes to do some more block cutting. 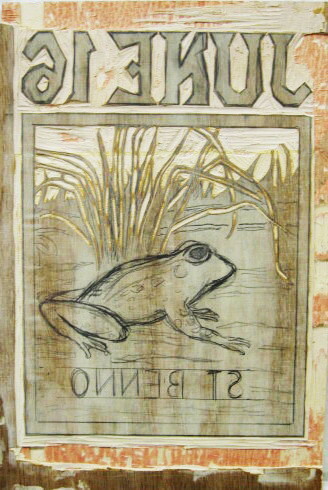 (that critique night comes up again this Monday had something to do with the decision) All of today's work was in the area of the grass above and behind the frog. I still have a few decisions to make in the space immediately around the frog, but that will have to wait until next time. It's been a long time coming, but I will be teaching my first ever shore area woodcut class. I had expected that I would be doing these regularly once I moved into the Studio, but there has been the minor detail of how to find interested students. We don't exactly get a lot of walk-in foot traffic down in the basement, and Molly and I haven't had much luck with promotional campaigns. However, it looks like I've found a solution to that problem- I'll be holding this class just a few miles to the south at the Belmar Arts Council. The BAC had shown an interest in such a thing in recent months, and I decided there were advantages of going through them. First, the class would be advertised on their website and the newsletters that go out to the whole mailing list every week. 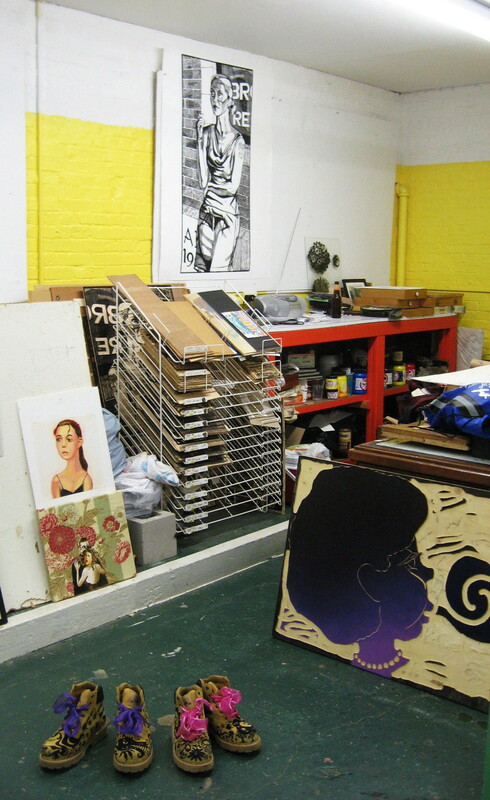 Second, the Boatworks has lots of work tables and uncluttered space, unlike my own place. Third, the Boatworks has very good air conditioning and heating, while my Studio is hot and humid in the summer, and a bit drafty in the winter. On the down side, I will have to bring all my supplies there for each meeting, and the BAC will take a percentage of all the class fees, but that should be offset by the larger class size that is possible. Now that it's on the schedule, I will have to start gathering supplies (wood, paper, and ink) and purchase some woodcut tools for everyone to use during our meetings. Meanwhile, if you would like to sign up, it's all done through the BAC. A page on their main website has the details and registration can be done right there on the computer. The class starts on October 25th, but registration will likely close several days before then, so if you're interested, take care of it soon. For the past week or so I've been using my old studio chair as a prop in my classes, and in between I kept it in my apartment. But that part of the semester is over, so I left it in the car after the last class. After work today I dropped by the Studio to bring the chair back. And as long as I was there, I figured I should finally continue work on the block begun at my presentation a week ago. As I typically do, I cut the outer margin first, then moved on to the date at the top of the block. Very quickly I ran into a little problem. With plywood there is always the possibility that there are flaws or variations in one of the layers under the surface that can affect cutting and printing. Usually it's a small area, but I ran into a big one today- a long strip of empty space in the core wood, about 3/4" wide, running the whole vertical length of the block and under some visual elements that can't be moved. In the photo to the left, it's the light colored strip that starts above the 6 and goes down to past the bottom of the image. One thing that can vary from board to board is the thickness of the veneer over that core wood. Luckily in this case the veneer was thick. So at least I was able to still cut those areas above the flaw- instead of cutting all the way down to the inner core (the reddish wood), I just cut down as far as halfway through the veneer. Deep enough that it should be easy enough to ink, but with enough left that it shouldn't cave in. So far it worked for the date section, so I'm hoping it holds together for the rest of the block. Tonight was the opening reception for the exhibition JERSEY SHORE: Images from Sandy Hook to Atlantic City, at Heaven Art and Antiques. 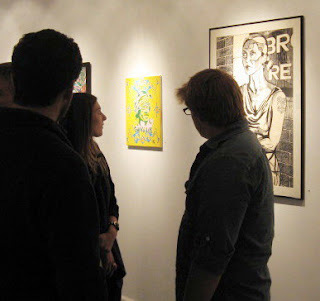 Actually it was a big art night there on Cookman Avenue, with multiple gallery openings on the first few blocks. But of course I made my show the first stop. The ground floor of the building is an antique shop, but there is a long narrow upstairs room that has been used as an art gallery for a few years now. 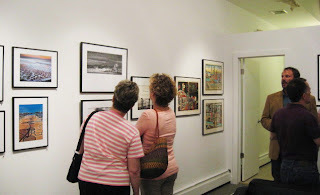 The show included 63 framed works, with several of those in the landing by the stairs, and the rest in the main room. 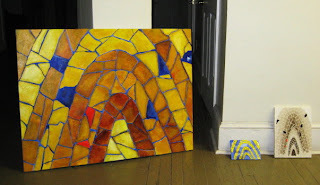 My three pieces were grouped together in the back corner, near the doorway that led to the refreshments table. My works stood out, if for no other reason that they were among the few that weren't photographs, which made up 84% of the show. There was some confusion leading into the opening, as we were all asked to state the original location for the image- easy for all those photographers, but my boardwalks are mostly products of my imagination, sometimes combining bits of several locations. I e-mailed this to the curator, who liked my answer so much that he put the little explanation of each inspiration right on the gallery list. As for the work itself, the response from those I talked to was the usual mix of bewilderment that anyone actually still does woodcuts (all those photo based artists would be lost without their computers) and what seemed to be a real appreciation for the resulting images. The room got really crowded at times, so I took time to check out a few other shows on the street, running into a some people I knew. (artists, gallery visitors) I made one more pass through my show, then called it a night. 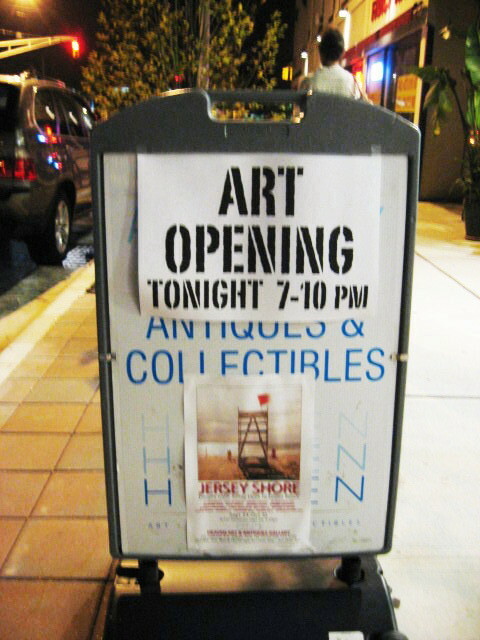 The JERSEY SHORE exhibition is at Heaven Art and Antiques, 721 Cookman Avenue in Asbury Park (one block from Main). The show remains up through October 30th. Yesterday I was in Westfield as a guest of the Westfield Art Association. I had been asked to appear as the guest artist of the month, to present my art and process to the group. Every few years I get invited to do one of these, so I have a set routine. I told my contact that I would do a slide presentation, and then demonstrate some block cutting and printing. They had never had slides before at one of these, but they were open to the idea and had the room set up for them (above) when I arrived. The meeting opened with the members (close to 20 in attendance) dealing with some organizational business. Then they turned to floor over to me. 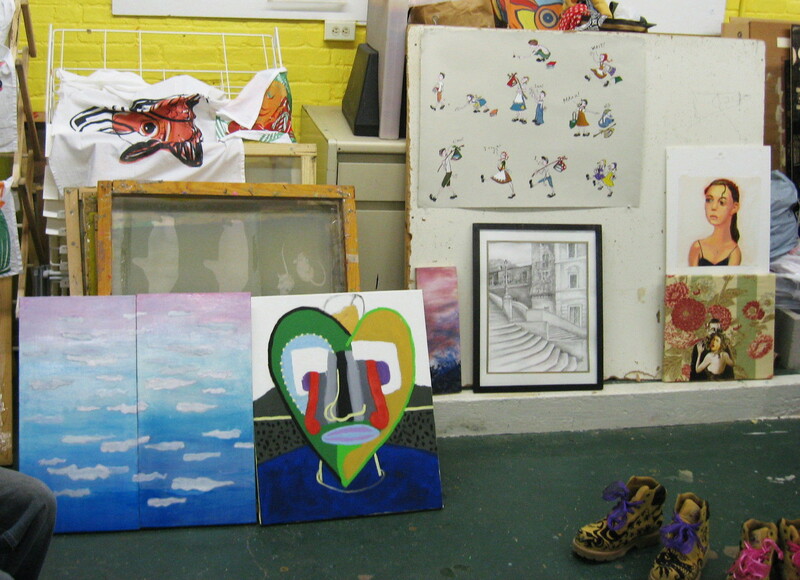 I had some small framed works set up at the front on some small table easels, as a supplement to the slides. 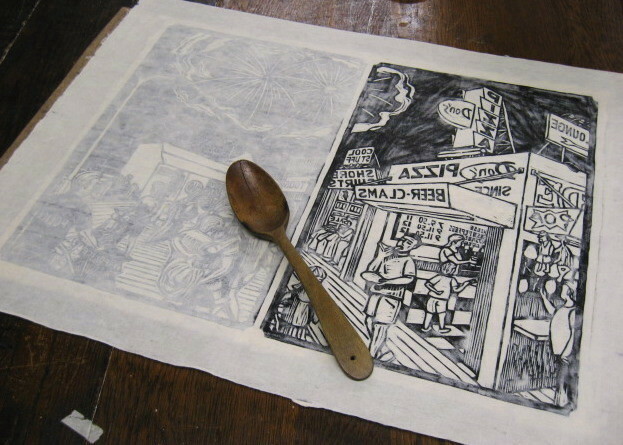 I showed slides of a dozen or so examples of historical printmaking, to explain the evolution of the medium and process behind each type of printmaking. 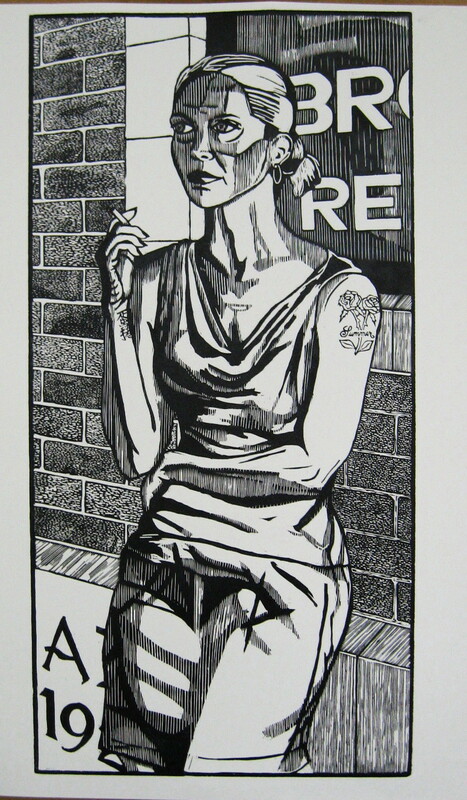 Then a few examples of some prints by members of the Outlaw Printmakers. 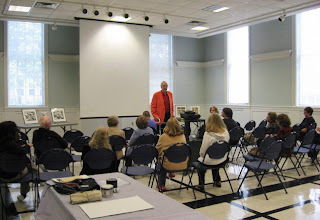 Then I gave an overview of my history as an artist, showing some slides of early student paintings, the first woodcuts, the highlights of my grad school years, and then some representative examples of my professional New Jersey work. The group took a break for refreshments (a long table with nice variety of foods and beverages) and to move the chairs over to a set of tables on the side of the room, with tilted mirror mounted behind it. I showed a few more examples of actual prints, such as a few unframed supermarket prints, some of the boardwalk prints, and the first proof of my smoker image. I had brought the new St Benno block with me, discussed the different kinds of cutting tools I have, and demonstrated how each is used to do different kinds of cutting. I didn't get very far in the process, but at least people could see the resulting cut sections. 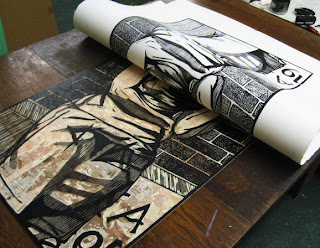 After that I did a demonstration of printing, using an old block. Then it was time to clean up my ink and pack up to leave. I put out an assortment of old postcards from shows, many of which were taken. I believe that the two hour event was successful. Some in attendance were very interested and asked many questions- about my art, the process, and the materials. The art itself received many compliments and a few people told me specifically how much they enjoyed my presentation. I'm glad it all went off as planned and am always happy to spread the knowledge of printmaking to an appreciative crowd. After a hurricane caused delay of a few weeks, we finally had the reception for the Art on the Edge show at the Boatworks. We had a good crowd, some cool live music, tasty food, etc. I received a lot of compliments for my piece. 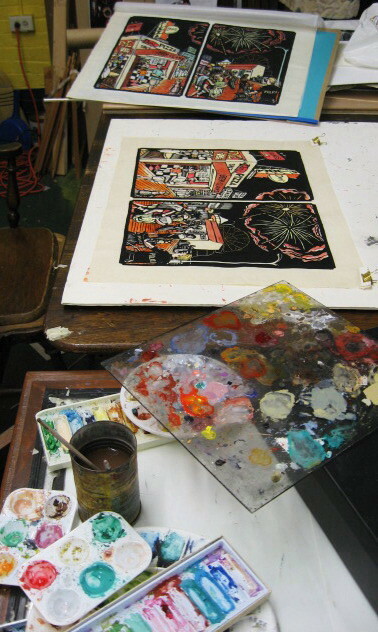 Though woodcut is an ancient and simple process, it is still a mystery to the uninitiated, and therefore very impressive in itself. And people are also liking the image as well. 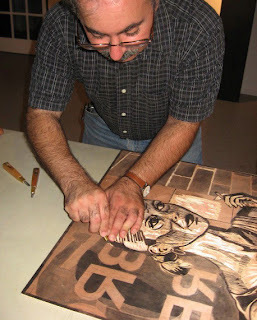 I used the occasion to talk up my proposed woodcut class at the BAC. I plan to settle all the details this week, so it can be announced soon and start by the end of October. Another thing that I dealt with today was starting the block for my next print, which will be part of my Everyman series. I had no immediate demand for any new saint print, but with more than 75 of these under my belt, it's not too difficult to get one going on short notice. Looking at my whole list of saint prints, I had noticed that the fewest came from the months of May and June, mostly because these were the last months I got to originally and I hit the deadline for my MFA show, which had 61 of the first 66 in the series. So I chose a day in June and started reading. For this particular day I found a few workable options, but decided to go with St Benno. His life itself is typical, but I noted a story told about him, when he was upset at the croaking of frogs (which he saw as an insult to his love of fine music) and silenced them by command. After a few minutes thought he decided that animals praise God in their own ways, and took back his order of silence to the frogs. I like the story, but what clinched it for me was that I had done an image of a toad several years ago for a group folio, an image that I could adapt quickly for a new print. I made a few anatomical changes to make the bumpy toad look more like a smooth skinned frog, but the close up grass and weeds are pretty much directly from the earlier print. However, unlike my toad image, this one will be color, so I'll be making some other changes as I go. If I have any time I may make some adjustments to the sketch before I start cutting it tomorrow at my presentation in Westfield. 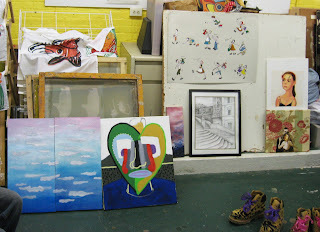 This morning I got back to work on getting ready for an upcoming show in Asbury Park. 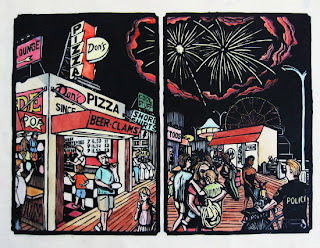 The theme of the exhibition is scenes from the Jersey Shore, and if that doesn't sound like an occasion for my boardwalk prints, I don't know what is. 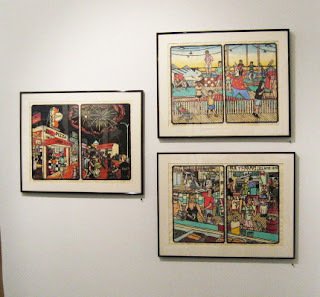 Actually I had the first print from the series hanging in this location a few years ago as part of the Tri City Arts festival, so I chose 3 other prints from the series that were very specifically boardwalk scenes. 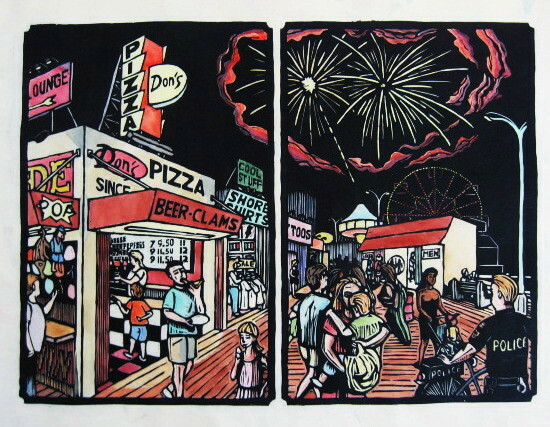 (the tattoo studio, arcade, and shower room are all based on the boardwalk experience, but could also be found elsewhere) I already had the food scene in a frame, but I had to frame the miniature golf print and of course the night scene that I had just finished copying yesterday. In the early afternoon I brought the framed pieces and paperwork up to the gallery. I was hoping to park close to the gallery, but there was some kind of festival going on, and the closest spot I found was a few blocks up Lake Avenue, probably not that much closer than if I had just walked from the parking lot at the Studio. Still, no problems carrying the three framed pieces there, which I turned over to the gallery owner and got on my way. 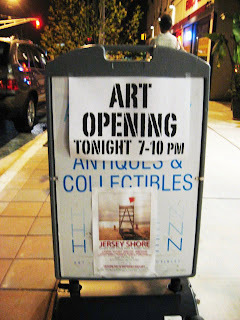 The show is in the upstairs gallery at Heaven Art and Antiques, 721 Cookman Avenue in Asbury Park. There is an opening reception on Saturday, September 24th from 7 to 10 pm. After work today I dropped by the Studio to try to finish the coloring of the 3rd proof of the edition for this boardwalk night scene print. About an hour later I was pretty much done. The clouds around the fireworks need another layer of deeper color, but I can do that later based on what is there and my memory (and photos if I need to). I hung the new one up to finish drying, and packed my sample copy to take home to frame. I also grabbed some of my print demo stuff, all the materials related to printing. This will be for my presentation in a few days. Left the cutting stuff behind, since I am hoping to cut out the margins on the new block at some point tomorrow. Today was my first weekday off in a while, so I took advantage of it to get some urgent work done in the Studio. The first thing I did was find a spare piece of lauan, cut it down to a smaller panel, and prepared the surface with wood filler. That process looked kind of like this. 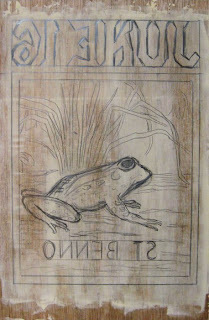 The block is for this weekend, since I am doing a demonstration of woodcut technique and need something to cut. Set that aside to dry. Next I got the recent proof of the boardwalk after sunset print down from the wall and started coloring it. Since I have to turn in (to a show) the only completed copy I have this weekend, I want to have a backup colored proof ready to go before then. Having a completed one available to look at helps the process go quickly. In a few hours I completed just about all the warm colors, which is the majority of the color in the image. Another hour or so should be enough time to finish the job, which I can do tomorrow or early Saturday. Before leaving I sanded down the block I had started, and drew on the panel boarders in pencil. Over the next 2 days I need to sketch in the design. I have an idea about what it will be, but I'll talk about that after it gets started. Out in our hallway gallery annex, we had charcoal figure drawings from Vince (above), and Edy (below) continued to explore architecturally influenced compositions with paint and collaged material. Don't have a photo of Adele's late arriving piece, a mixed media commissioned poster. This was the first time that anyone in the group except Molly has seen my new print (and for this proof from yesterday it was everyone's first time). Generally very positive reaction, with specific praise for the overall presence of the figure, the scale, the pose, and the expressiveness. The variations in the window reflections and the brick textures were also singled out. A few people mentioned a mark or two that they might like to see lightened or removed, and I'll consider those when I have some time, but one has to be pleased with the reaction the piece has gotten. The 36th Annual PCNJ Member exhibition, most recently seen at the PCNJ headquarters in North Branch Station, is about to open in a new location. 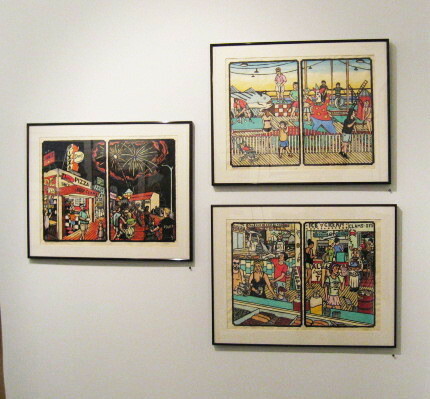 The show is traveling to the Harold B Lemmerman Gallery at New Jersey City University. There will be an opening reception from 4:30 to 7:30 pm on Thursday, September 15th, and remain on display through October 26th. The show includes 45 prints and related artworks, selected from over 200 submissions. The piece shown above is my contribution to the exhibition. I will be making a public appearance this weekend to discuss my work and my process, along with printmaking in general. The occasion is the September meeting of the Westfield Art Association, as part of their ongoing series of artist presentations. In addition to discussing historical and contemporary printmaking, I'll be demonstrating the basics of cutting and printing a block. I've been told that the meeting is open to the general public and as far as I know there is no admission free. The meeting and artist presentation will be Sunday, September 18th, from 2 to 4 pm. 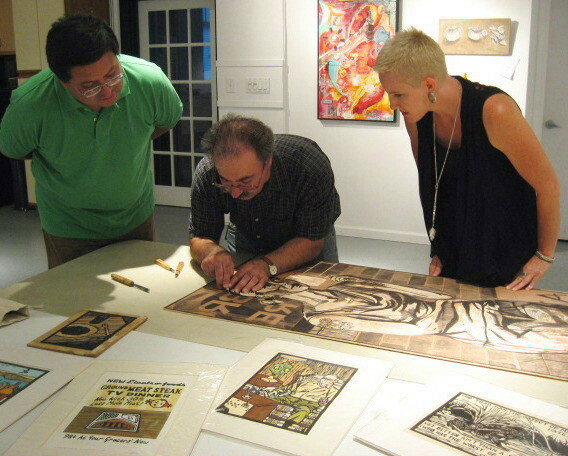 The Westfield Art Association meets at the Westfield Community Room, in the town's municipal building, 425 E. Broad. Directions are available on the organization's website. Another task on my list for a while now was to pull a full size properly inked proof of my smoking block. The hurricane set everything back a bit, and I don't need this for any immediate upcoming show, but I did want to have it to show at our next critique group, and that will be tomorrow. I had bought some large heavy western print paper (don't remember what exactly what type, but about 50"x 38") about a year ago specifically for this purpose and have stored it in the Studio ever since. I was there for about 5 hours overall, though that time included bringing back some of my mat cutting supplies, eating lunch, and an investigation into a burning smell (microwave popcorn in the ceramics studio) that had filled the building. 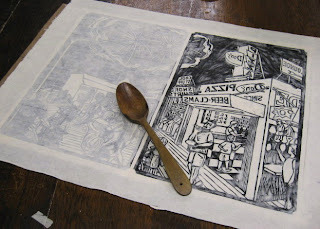 I cleared my table and put out the block, long dry from the last printing. I made a few minor trims along the shoulder/neck area, to help the value separate a little better from the window behind her. Basic inking took about an hour, and a little more time for taping. Since I didn't have a lot of margin for error in placing the paper (only 2 inches longer than the block itself), I used tape marks to measure paper placement. I rolled the page out over the inked block- not perfect, but good enough. Printing was a bit more difficult. Heavy stiff papers have the advantage that they don't pick up as many stray marks in the rubbing process, but they do require more ink and more physical exertion. Just about all of it need some re-inking, but there was enough ink on the block to begin with that the paper stayed in place as I lifted one side or corner after another, over and over. Just as the Giants game was about to begin, I pulled the proof off the block. I had to fix a few flaws related to the block itself, and did some minor touch up, but otherwise the print looked just as it should. 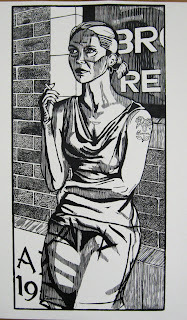 There's a little bit of grain mark showing in the solid black areas, but I don't mind that in these large figure pieces- this is a woodcut after all. I hung it up on the tack wall to dry, which is also a good place to display it for the purposes of tomorrow's critique group. After that I cleaned up and headed home. Was a busy week, with the start of school and all that. I had a bunch of art related things on the agenda today, but only got to some of them. This morning I learned that my cousin Todd and some of his family were coming up into the area this afternoon for a cookout. 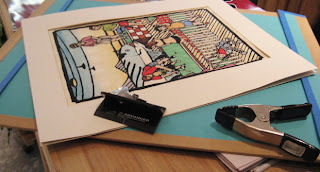 Beyond the usual family stuff, this interested me because I had printed and colored a single panel version of the boardwalk miniature golf print for him several months ago. This was because that particular golf course was a favorite place in our childhood. I had shown him an early version of the whole print and had told him that I was making one for him, and this seemed like a good time to get it to him. I suppose that I could have just given him the print, but with the print being so delicate, I decide I'd go ahead and mat it for him. So I went down to the basement in my former house (which still has a lot of my stuff) and brought up all my mat and backing boards. If I had more time today I would have set up in the Studio as I did a few weeks ago, but I also had a commitment to gallery sit in Belmar, so my visit to the Studio today was just long enough to pick up my mat cutting stuff, and I hauled it all to the Boatworks. With no visitors around, I grabbed a folding table from the closet and set up my work station. In my bags of mat boards I found two smaller pieces that would be perfect for a window and backing board for a 16" x 20" mat. (a common ready made frame size) I cut the window while it was still quiet, but we had surprisingly large number of people start coming by to see the show, which required my attention. Still, but the end of my shift I had assembled the hinged window mat, with the print mounted in place. Moments later I was at the cookout. I left the artwork safe in the car until the end, but got it for them as they were leaving. They were very pleased, as it's not only a nice print, but I used images of some of the family in my print, plus there's the giant fish. Still a bunch of other things to get done, but they'll have to wait for another day. It's been about 2 weeks since the last time that I posted here. A good bit of that was because of Hurricane Irene. The day before it arrived I stopped by the Studio to make sure that anything of value that could be damaged by flood waters was wrapped and off the ground. And because of ongoing pockets of power outages around the county, I minimized excursions for the following week. Then there is my ongoing move, and some school related activities. I did stop by a few days ago and found no evidence of storm damage, so that was a relief. Over the weekend I learned that I had 3 of my boardwalk prints accepted into a show in Asbury. (I'll post details in the near future) I currently have two edition copies of all 7 completed prints, some of them in frames. 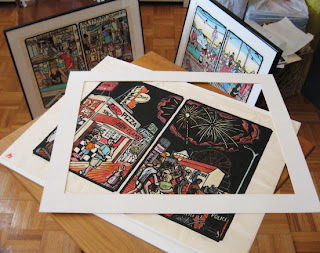 One of the accepted pieces is my night scene, which is in a frame, but that framed print is out as part of a traveling show and won't be back until after this Asbury show has started. I do have an available mat and frame for the second copy of the piece, but that would leave me without a completed copy in my hands, should I need it for something. The solution is to print a third edition proof. If it was a black and white piece I wouldn't worry about it, but the only way to get the colors exactly right on this is to copy them from an existing one, so I need to take care of that in the next 2 weeks before I deliver the piece. I began that process today. Actually I spent the first hour putting away all the stuff I had carefully packed before the storm, so I could have my work table available to work on. Spent the second hour inking and proofing the block on the standard Okawara paper used for these editions. 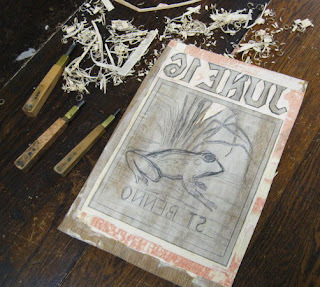 It seems that some of the special tools that I had taken home before Irene are still at home, including the thing that I use to rub my blocks, but I did have the old wooden spoon that I use for class demonstrations, and it did the job just fine. The above photo shows the process half done- rubbed with the spoon on the right side, and just a bit of initial hand pressure on the left. Just a few small spots required re-inking, and then I had a nice clean print to hang up to dry. By this weekend it should be dry enough to color, which will keep me on schedule for the gallery delivery. In the next few days I am hoping to find time to pull a new full size proof of my smoking block on white paper before next week's critique group, but that could be a 3 hour job, so it will have to wait a little bit. Meanwhile, the shortened framed copy is currently on display at the reopened Boatworks through September 23rd, part of the Art on the Edge show.